The European Investment Bank (EIB) announced yesterday its support of the port development projects of Marseille Fos by allocating EUR 50 mln (USD 57.6). The partnership agreement was signed by Christine Cabau Woehrel, CEO of Marseille Fos Port Authority, and Ambroise Fayolle, EIB Vice President, upon their visit to Darse 2, the junction of the port’s two existing container terminals. The aim of the signed agreement is to provide financing for the five projects that require a total investment of EUR 136 mln (USD 157 mln). These include the reconstruction of international passenger terminals and the enlargement of the North pass in the Eastern basin to enable accommodation of large cruise ships. In the Western basin, these projects include the renovation of the K3/K4 substations for the supply of ship fuel, further development of the Feuillane logistics zone and the extension of the two existing berths in order to offer 2.6 km of continuous quay space for the largest containerships of today. 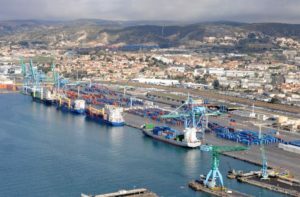 The sharp increase in traffic in the last three years has consolidated the credibility of the port of Marseille Fos in France and internationally. The port was able to take full advantage of the economic recovery by pursuing its strategy of diversification and conquest of new markets.